Signs such as the one above are offending some residents of Southlake. Some Southlake residents took up a protest against XTO Energy’s hopes to drill for natural gas in the community. Their protest included signs playing off the f-word as it relates to a technique — called fracking, a divertive of “hydraulic fracturing” — that makes the gas easier to harvest, oh, and pollutes the environment. 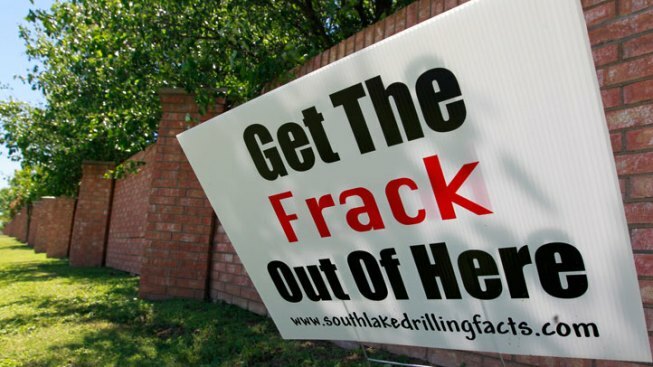 It doesn’t take much of an imagination to conjure up mental images of the protest signs: "Get the frack out of here" and "Don't frack with me," according to an article in the Fort Worth Star-Telegram. The signs, evidently, have offended the delicate sensitivities of some Southlakeans. The article also states that residents’ complaints have “poured into Town Hall,” but the mayor called it a First Amendment right for the protesters to post the signs, which are on private property anyway leaving the city with little to no recourse. C’mon, we all know what someone means when he or she, being the righteous-type, let’s loose with an, “Oh, fudge” exclamation. Wonder if those fudgers in Southlake complained about the signs. Bruce Felps owns and operatesEast Dallas Times, an online community news outlet serving the White Rock Lake area. LMFrackingAO.